I mostly followed the recipe with ingredients I had on hand. I added Italian parsley and sage from the raised beds (that made it through last nights temps of around 9 degrees Fahrenheit) then added some of our farm raised dried red pepper in addition to about a cup of Red Guitar (!) Old Vine Tempranillo Garnacha left over from last night. 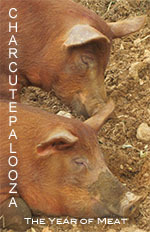 While on Michael Ruhlman’s site, a cute picture of some red pigs caught my eye. CharcutePalooza? Right on! What a coincidence! Though I did not see any telltale wattles on the pigs, I clicked to find out more. Interestingly, I had just this past Friday, conversed with a local farmer friend about preserving meats and told him this was my year for learning about how to make Virginia style hams, prosciutto and all other good things porky: smoked preserved and otherwise cured. I love how things come together in life and the universe gives you a kick start when you really need it. This is all part of my journey here in Tennessee towards learning the old way and in doing so, I plan to document artisan skills that are nearly lost. I believe it’s why I became a farmer in the first place and is a perfect opportunity to stay focused on the goal. Here are the “Ruhls” as posted on the Mrs. Wheelbarrows Kitchen site (see link to site above re: charcutepalooza). * Let’s celebrate the age-old talents and skills of charcuterie with contemporary takes on techniques, flavors and presentation. * Let’s agree to use humanely raised meat, sourced as close to home as possible. * Let’s write about our experiences. Not just how the charcuterie is made, but how we use it, serve it, flavor it. * Buy a copy of ‘Charcuterie: The Craft of Salting, Smoking, and Curing’ by Michael Ruhlman. * Cook along as often as practical. There’s no obligation. * Post about your experiences on the 15th of the month. I am joining this challenge if only for the pork portion (since that’s what I have) in order to keep things simple. 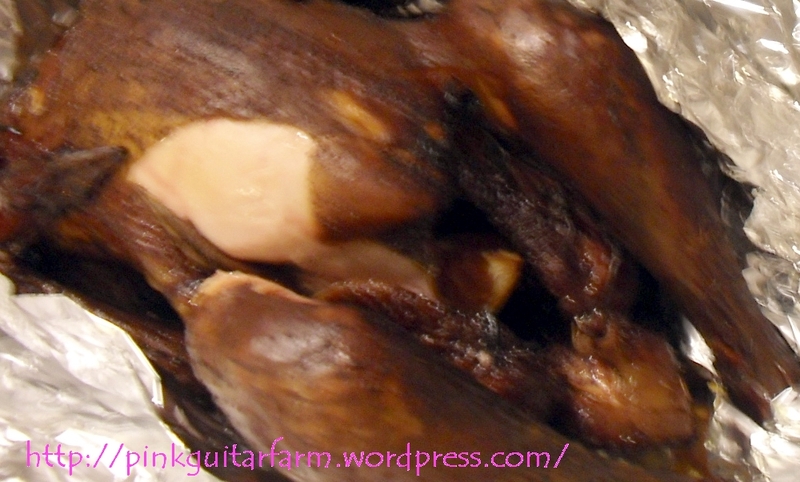 Duck Prosciutto, January’s challenge sounds wonderful, maybe next year? I’ve been hoping for a pond this year in order to raise more fowl. Yet another Mr. Pink Guitar honey do list item… The cool thing about this challenge though, is that anyone who has access to humanely raised meats can participate. So I am off to purchase the book, please feel free to join me in this challenge, I would love your comments. Oh, and I will keep you posted on how the smoked chicken turned out. Then we phoned up our West Coast expert smoker friend, Steve, for advice. Here is what we SHOULD have done, and will do so next time. 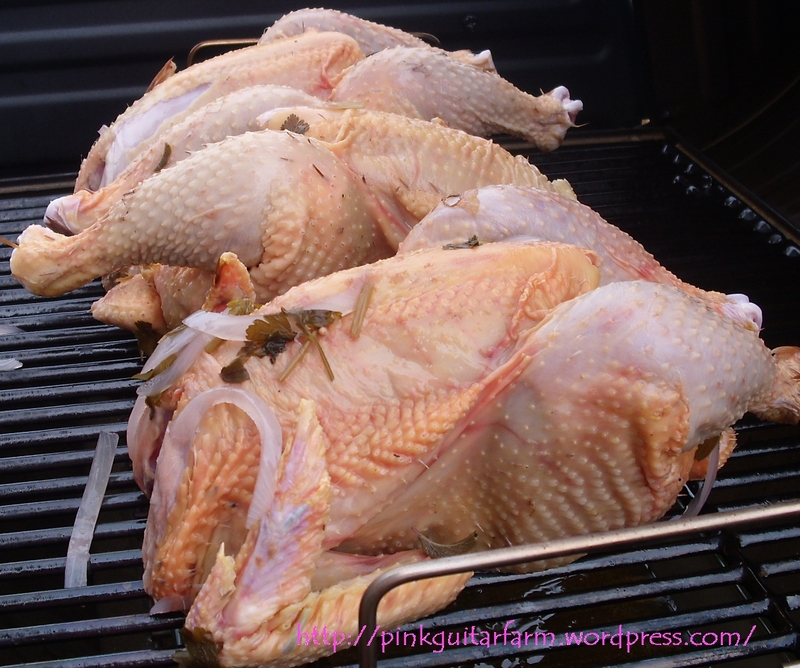 Brine for at least 12 hours, then, and this is critical: RINSE THE BIRD prior to smoking. 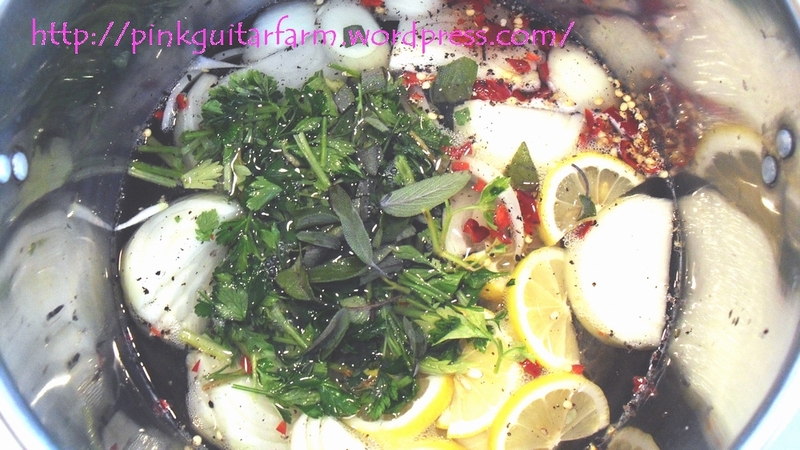 We only had our chickens in the brine for a few hours and did not rinse them, so, although we sacrificed full tender juiciness, we still got great flavor without too much salt. The chicken was delicious, even with our errors in planning. I would love to tell you that we sat down to a fabulous meal of smoked chicken, a nice bit of couscous, some healthy winter greens and then complimented the smoky flavor of the chicken with a sweet ginger/plum chutney, but we got it to the kitchen and devoured it with a chopped salad. The bad, blurry picture below shows how horribly IMPATIENT we were to try the chicken. Sorry, the picture just doesn’t do it justice. The next day, it was served in sandwiches with that beautiful ginger/plum chutney mentioned above – sent to us this summer by more good friends on the West Coast. We feel lucky to get to eat such wonderful food and it is even more satisfying to know that we raised those chickens here. We also really appreciate all of the good help and flavors sent from so far away!